An entry into cinema happened by chance for Pujita. But now, she’s hooked. For an avid short film watcher, the name of Pujita Ponnada would be very familiar. After all, in just a span of two years, she has become a star in her own right. Turns out, director Sukumar too spotted her when he saw the short film Parichayam, which became her golden ticket. She’s now set to be seen in an important role in the director’s production venture Darshakudu, and also in his next with Ram Charan. “I had worked on an ad film with Sukumar garu, and soon after, the films happened. It has all been surreal. I am glad I got a good start,” shares Pujita, who was born in Vizag, but spent her formative years in Chennai. Interestingly, her career in showbiz began when she came to Hyderabad to pursue a software job. “I never thought of taking up this line of work. But after working on my first ever short film, Upma Tinesindi, things just fell into place. However, I wasn’t sure if this was what I wanted to do in the long run and kept my job, while I did the films and music videos. Whenever I took up something it was just for fun,” she recalls. Quitting the job was a big deal. “I had to convince my parents, and more importantly, I had to convince myself that this was the right decision,” shares Pujita, who adds as an afterthought, “Once you have had a taste of cinema, it is so tempting that you can’t resist from returning. It’s like a drug. 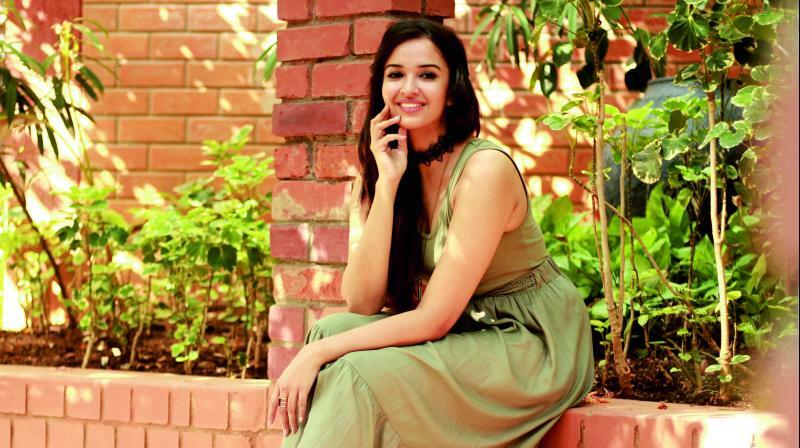 I am now glad to be here.” Ask her how different movies are from short films, she reveals, “My short film stint made me comfortable in front of the camera. The fear of remembering lines, looking perfect and performing well was always in my mind. But not anymore. However, even now, sharing screen with a big star can be a bit unnerving,” she says.